In a U.S. presidential election, every vote does count. Students will examine the presidential election process established by the United States Constitution. 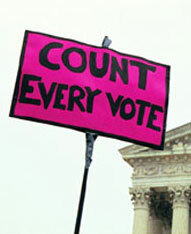 Students will then analyze the 2000 presidential election as a case study of this process. Explain to students that they will examine how the election process for U.S presidents works. The teacher can also explain that after students have a good understanding of the Electoral College process, they will examine the 2000 presidential election. Note: You will need to sign up for a free trial to view the video. Because students are often confused about what an “Electoral College” is, the teacher should also show a video clip from the National Archives that explains what the Electoral College is and what electors are. >> What is the Electoral College? As needed, use the U.S. Electoral College Teaching Resources to reinforce understanding of the Electoral College process. Ask students to explain the difference between the popular vote and the Electoral College vote. Divide students into small groups, and distribute chart paper and markers. Explain to students that they will conduct a brief research project in order to create a flow chart explaining the presidential election process. Have students share their charts with the class and post them around the room. Facilitate a discussion reinforcing understanding of the Electoral College process and the difference between the electoral vote and the popular vote. Explain to students that the 2000 presidential election was the closest election since 1876 and only the fourth election in which the electoral vote did not reflect the popular vote. Introduce the 2000 election by showing the Presidential Election Process video clip. Student presentations may be in the form of, but not limited to, a PowerPoint, a Prezi, a news broadcast or an infographic. Students will present their final products to the class. Point out to students that the 2000 election was not the only controversial election in U.S. history. The House of Representatives have had to decide several elections. In other cases the winner won the electoral votes, but not the popular votes. Explain to students that they will examine in further detail several controversial elections, considering both the positive and negative aspects of the Electoral College. Tell students that they will take a position regarding the future of the Electoral College. Students will need computers and Internet access to complete the learning module about the Electoral College. This 2005 article highlights a joint effort by former President Carter and James Baker to make significant changes in how Americans vote. Describe the Electoral College process. Identify major events in the 2000 presidential election. Explain James Baker’s role in the 2000 presidential election. D2.Civ.4.9-12 - Explain how the U.S. Constitution establishes a system of government that has powers, responsibilities, and limits that have changed over time and that are still contested. D2.Civ.5.9-12 - Evaluate citizens’ and institutions’ effectiveness in addressing social and political problems at the local, state, tribal, national, and/or international level. D3.1.9-12 - Gather relevant information from multiple sources representing a wide range of views while using the origin, authority, structure, context, and corroborative value of the sources to guide the selection. D4.1.9-12 - Use writing, visualization, and speaking to construct arguments using precise and knowledgeable claims, with evidence from multiple sources, while acknowledging counterclaims and evidentiary weaknesses.